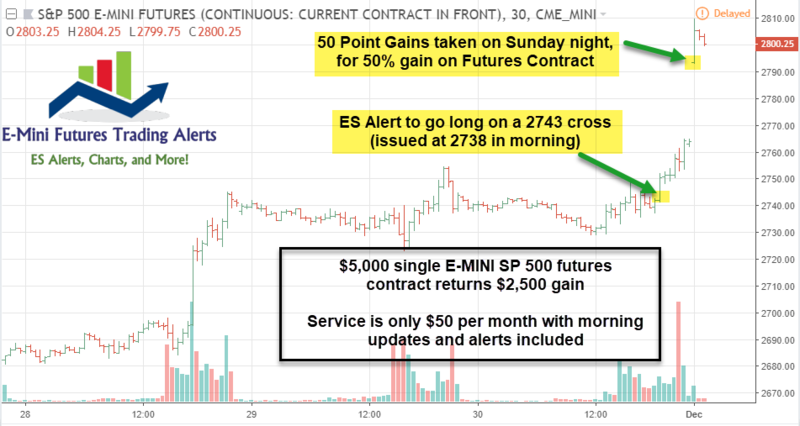 E-Mini Future Trading Service – Hosted on Stocktwits.com and launched in October 2018. This service focuses on the SP 500 using our market map models and then translates that to Futures Trading advice and alerts. Short term and long term views…morning updates, trades and more. Join for $50 a month! Up 50% on our most recent trade put out on Friday, gains taken on Sunday night. Results: 50% gain taken on Sunday night 12/2/18 at 2793. A $2,500 gain on a $5,000 contract. For the week ending Nov 30th, indices closed the month of November strong. The SP 500 finished the week up +4.9%, with the Russell 2000 up +3.0%, Nasdaq 100 up most at +6.5%, and the Dow up +5.1%. Last week’s decline was enough to consider a truncated bottom or, more likely, the SP 500 is in a protracted B wave of larger degree, as shown by a W bottom pattern. We are still in Mercury Retrograde window ending Dec 6, and we called for a turn near the midpoint of this window last weekend. 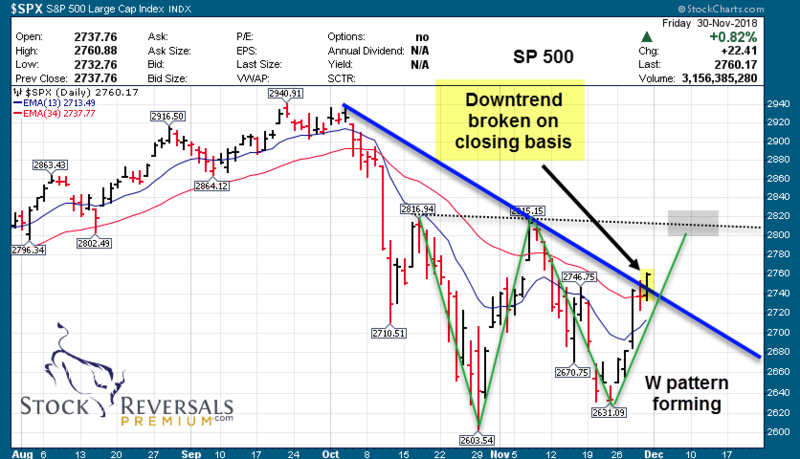 Since the bottom turn, the SP 500 has climbed 130 points. 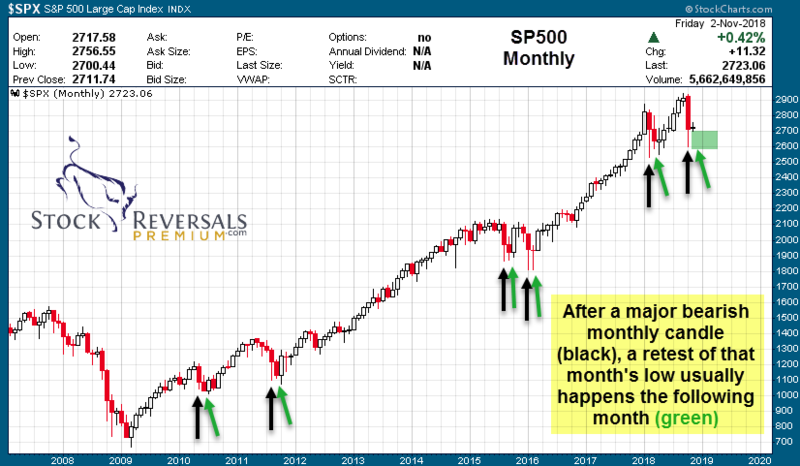 As noted from our 11/4 weekend report, we pointed out that “we would likely expect a retest of October lows (or at least an attempt) sometime in November.” The chart from that report is included at bottom, with November update. The markets have bottomed primarily with the help of extremely oversold conditions coupled with bearish sentiment across the board. 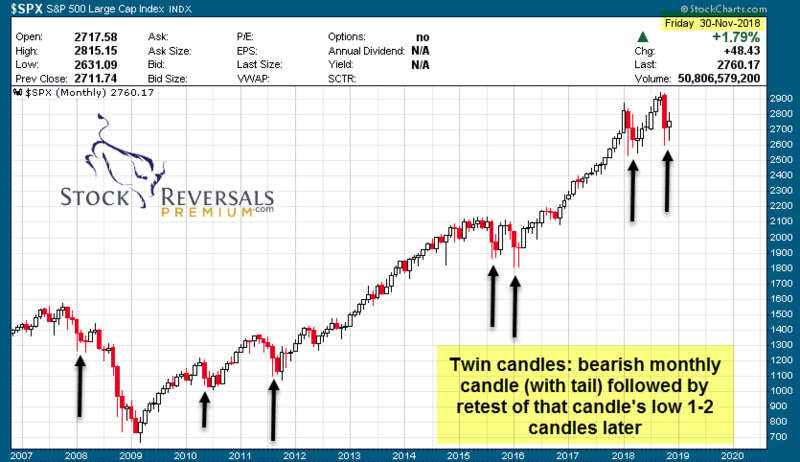 We noted that Biotech and the Small Caps had relative strength going into last week, which should have been a tell we were due a strong bounce. We will continue to watch sentiment readings as well as breadth for the markets to see how sustainable the upcoming rally will be. 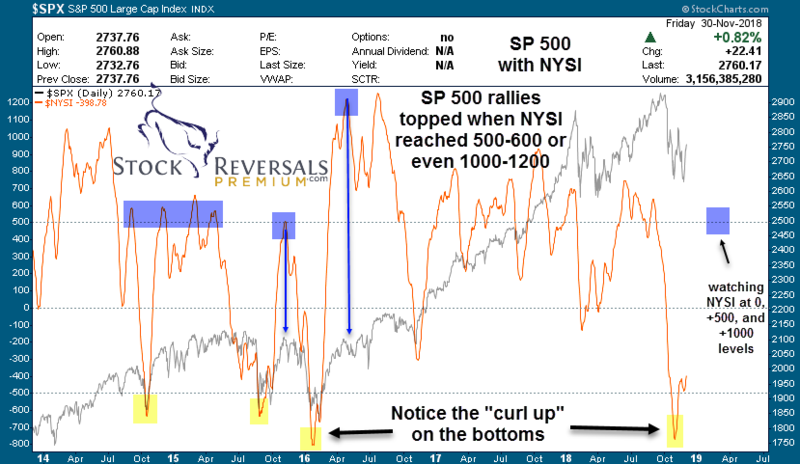 If history is any guide, we expect the NYSI Indicator to approach the 500-600 level before any major rollover is due, however if it cannot reach or exceed this level, then our large C wave targets may come into play fast. There are many swing trade opportunities setting up, and in our Premium Service, we initiated 3 new swing trades last week, while taking profit on a 1/2 position for 8-9% gains on Friday. Our Premium service continues to be selective in alerting the best stock candidates, which we may hold as little as a few days or as long as weeks at a time. We have a 70% Success Rate in terms of having profitable trades alerted to members since our September 2013 inception! 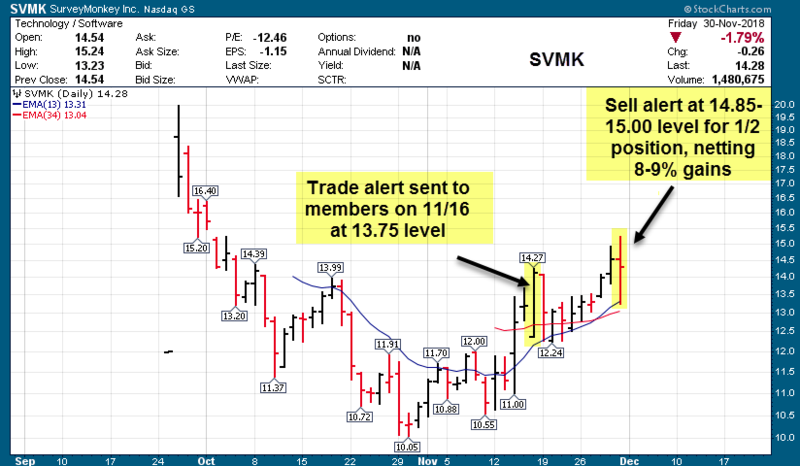 We highlight another swing trade winner we closed a partial position on this past week. Once again, it’s a Post IPO Base Swing Trade. 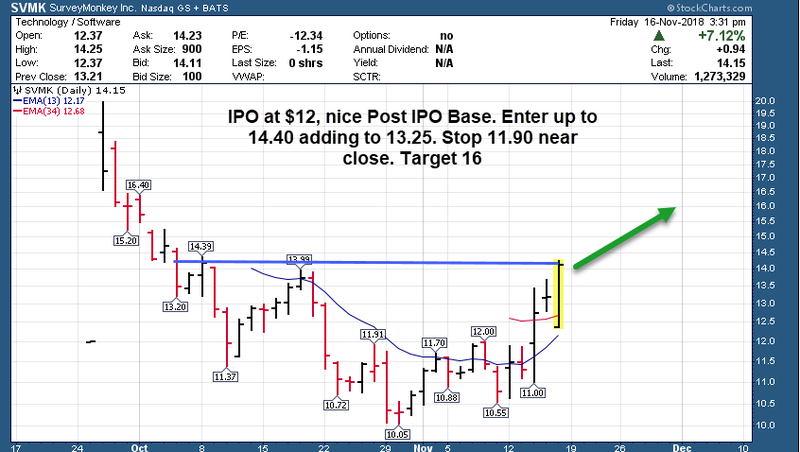 For details on what a “Post IPO Base Swing” is, please see the November 18th weekend report here. The company went public right before the October market crash and traded down below the IPO price after initial spike. Our premium subscribers got an opportunity to buy at a discount after the initial selling. As projected, the stock has rebounded and we have already taken partial profits so far, holding the other 1/2 currently. With only a 9 day hold time and 8-9% average gain, $5,000 invested in this trade would have paid for almost 6 months’ worth of SRP subscription! GOOS – double inside week following 5 month breakout. Beautiful high flag above breakout range. Designs, manufactures, and sells premium outdoor apparel. 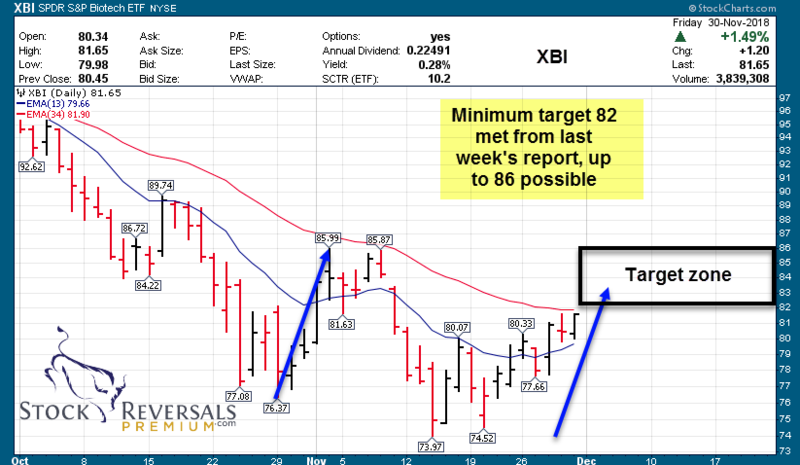 NBEV – up almost 18% last week, filling 4.70 gap. Can see 5.4 or even 6.0+. Operates as a healthy functional beverage company. We entered at SRP on Friday this past week around 4.60 with stop in place and add areas. INVA – price rallied to highs end of last week, starting to breakout, with 20 target a magnet. Company engages in the development and commercialization of bio-pharmaceuticals, with a portfolio of respiratory products. MEDP – Watch consolidation back to 56-59, and entry could be good for a move to 65. Clinical contract research organization, provides scientifically-driven outsourced clinical development services to the biotechnology, pharmaceutical, and medical device industries worldwide. HUYA – IPO selloff back to first trading day’s close of 16.0 in May, holding that 16.06 IPO close; Could be a major swing from here if China rebounds. The company operates game live streaming platforms in China. LL – still like accumulation for higher here, with plenty of upside to go. Nice volume last week. Target 14.50-16.00. Company operates as a multi-channel specialty retailer of hardwood flooring, and hardwood flooring enhancements and accessories. PTI – heavy call buying last week; looks like a massive bull flag, and could see a move to 6.00+ in short order. Company operates as a clinical stage biopharmaceutical company, discovers and develops novel therapeutics to treat cystic fibrosis and other diseases caused by an imbalance in the proteostasis network. BWA – looks ready to pop out of this flag. Target 44-45.50. Company provides solutions for combustion, hybrid, and electric vehicles worldwide. YY – inverse head and shoulders in play here; 75-82 could be target. Company engages in the live streaming business in China. MOMO – China play. Perfect 1:1 symmetry with 38-40 still in play. Basing in a W pattern, provided recent lows hold. Looks like accumulation. Chinese provider of mobile social networking platform. SINA – 8 week base; looking for a retrace move back up to 72-76. Company operates as an online media company in China. EA – possible snapback rally on last week’s positive close. Very oversold here, below monthly lower BB. Company develops, markets, publishes, and distributes games, content, and services for game consoles, PCs, mobile phones, and tablets worldwide. FN – 3 week ascending flag after power gap up to new 52 week highs. 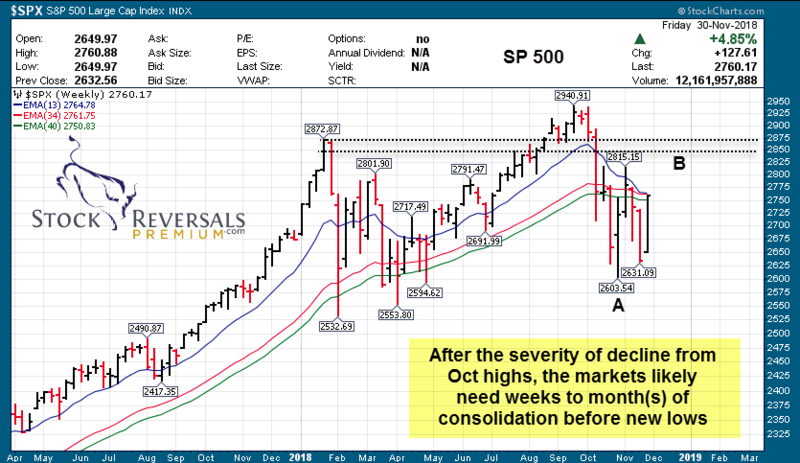 Textbook consolidation and relative strength to market. Provides optical packaging and precision optical, electro-mechanical, and electronic manufacturing services. KEYS – would love to buy any weakness for a move up to 65. Company provides electronic design and test solutions to communications and electronics industries internationally.